Allows you to type typographical characters. 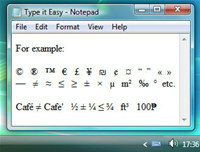 Type it easy is a free software that allows you to easily insert many unavailable on the keyboard typographical characters into any application. For example, it can be em and en dashes, typographic quotation marks, copyright and trademark symbols, euro and other currency signs, miscellaneous math characters, diacritical marks and so on. It works very simply: just hold down the control key (the altgr button by default) and press the necessary alphanumeric key. For example, pressing altgr and the 'c' key simultaneously will type the copyright symbol: ©. While pressing altgr and 'e' will insert the euro sign: ? Type it Easy is an utility that works under windows xp, windows vista, . It is Free so you can download it and share it with your friends. Estimated download time for Type it Easy on a common adsl connection is less than a minute. Version 1.5 was released three thousand nine hundred nine days ago by Nikolaj Masnikov. Click the green download button to download it now.